Simple mud concrete bricks provide the most affordable and sustainable houses in the tropics, a Sri-Lankan study suggests. Comparisons of four different types of walling materials revealed that mud concrete bricks have the lowest environmental impact and keep houses cool. They are also the cheapest, and easiest to dispose of when it may become necessary to knock a house down. Researchers compared mud concrete bricks with red bricks (modern fired clay bricks), hollow cement blocks and Cabook, the Sri Lankan name for bricks made from laterite soil, which are common in the tropics. The goal of the study was to find out which types of walling material are the most suitable for constructing affordable houses in the tropics, where population density and poverty are generally high. Mud concrete bricks are also the cheapest, at less than US$1,000 in Sri Lanka for an average-sized house, whereas red bricks cost nearly US$3,500. Mud concrete bricks are widely used in many other tropical countries. “Why spend more money and destroy the environment more?” asks Rangika Halwatura, a civil engineer at the University of Moratuwa in Sri Lanka, and one of the authors of the paper. Mud concrete bricks are made from soil in the same way as traditional mud bricks, but contain gravel and sand to improve their strength. The researchers looked at the carbon footprint of all four walling materials, and found that mud concrete bricks were the most environmentally friendly to produce and dispose of. Investing in the health and survival of the most deprived children and communities provides more value for money than investing in less deprived groups, saving almost twice as many lives for every $1 million spent, according to a new study by the United Nations Children’s Fund (UNICEF). “The evidence is compelling: Investing in the poorest children is not only right in principle, it is also right in practice – saving more lives for every dollar spent,” said UNICEF Executive Director Anthony Lake in a press release on the study, titled Narrowing the Gaps. The study backs up an unconventional prediction UNICEF made in 2010: the higher cost of reaching the poorest children would be outweighed by greater results. “This is critical news for governments working to end all preventable child deaths at a time when every dollar counts,” Mr. Lake said, noting that investing equitably in children’s health also helps break intergenerational cycles of poverty and gives them a better chance of learning more in school and earning more as an adult. The study analyzed new data from the 51 countries where around 80 per cent of all newborn and under-five deaths occur. It assessed access to six high-impact maternal, newborn and child health interventions: the use of insecticide-treated bed nets, early initiation of breastfeeding, antenatal care, full vaccination, the presence of a skilled birth attendant during delivery, and seeking care for children with diarrhea, fever or pneumonia. Global Africa is a striking, original volume that disrupts the dominant narratives that continue to frame our discussion of Africa, complicating conventional views of the region as a place of violence, despair, and victimhood. This new book documents the significant global connections, circulations, and contributions that African people, ideas, and goods have made throughout the world—from the United States and South Asia to Latin America, Europe, and elsewhere. Through succinct and engaging pieces by scholars, policy makers, activists, and journalists, the volume provides a wholly original view of a continent at the center of global historical processes rather than on the periphery. Global Africa offers fresh, complex, and insightful visions of a continent in flux. As I fly from Kabul to southern Afghanistan, I wonder about how people survive on what looks like endless, barren, sand-colored land stretching to the horizon. After the plane touches down, a rosebush garden greets us at the airport, and contradicts the stereotypical picture of southern Afghanistan—the oft-cited center of conflict in the country. Men wrapped in various shades of brown and tan patus, a sort of shawl/blanket, ride through town on motorcycles and bicycles. Although sunny, the winter air still holds a chill. The rest of the road is filled with its mix of cars, small trucks, and local trolleys, while the land outside town extends into the desert. On days like this, it’s sometimes hard to imagine that the country is at war. But even on this calm sunny day, checkpoints along the road and cautious discussions of recent incidents are a reminder of the insecurity and daily risks. A reminder of the conflict that has lasted for nearly four decades. I think of the impact of the last 40 years on the people of Afghanistan. Of the many acute emergencies, both minor and major, that have spanned those years. The communities that have had to adapt, to learn how to cope. Life here goes on, but the effects of conflict have slowly and relentlessly taken their toll on the availability of services, and on the people who need access to them. Meanwhile, the world speeds into the future, leaving them behind. As my eyes pan beneath the green mesh, I wonder if the people here feel left behind. I wonder if they still feel hope. MeshPoint is a smart and rugged WiFi hotspot designed to provide instant Internet access in adverse conditions, suitable for crisis situations. The idea for MeshPoint was hatched in 2015 when volunteers from project Open Network (Otvorena Mreža) in Croatia were helping humanitarian organizations and refugees during Syrian refugee crisis. They saw that humanitarian organizations needed communication for coordinating volunteers in the field, for logistics (having enough food and blankets in field warehouses, etc.). They also noticed that even all the biggest NGOs like Greenpeace, Red Cross, International Organization for Migration, UNICEF and others struggled to setup communication with their teams in the field, and how all current networking products are not suited to be used in crisis events by first responders. Open Network volunteers setup mobile and fixed wifi hotspots and gave them to volunteers and humanitarian organizations that were working in the field. In 2016, about 5,000 people drowned in the Mediterranean, and in 2017 the toll is already estimated at 2,000 people as of June. But how many die before reaching the coast and embarking on boats? There is every reason to believe that this is a silent disaster. As they pass through Libya in hopes of traveling on to safety in other countries, many refugees and migrants are robbed, abused, jailed, tortured, or even killed. Since July 2016, Doctors Without Borders/Médecins Sans Frontières (MSF) has provided lifesaving health care to refugees and migrants detained in Tripoli, and, in early 2017, expanded its operations to include a new project in Misrata. According to the International Organization for Migration (IOM), there are over 380,000 migrants currently in Libya. The majority of health issues affecting the patients are directly linked to the detention conditions and the violence that marks their journey: skin diseases, scabies, diarrhea, respiratory infections, muscular pain, wounds and psychosomatic disorders. Some came to work in Libya, which once was an economic “El Dorado” for nationals from neighboring countries. Others work to try to secure funding for the Mediterranean crossing, working under conditions that fell within the scope of forced labor and were interrupted by periods of detention or are at the very beginning of their journey across Libya. What makes these images particularly painful to look at is the realization that this humanitarian crisis is entirely man-made. 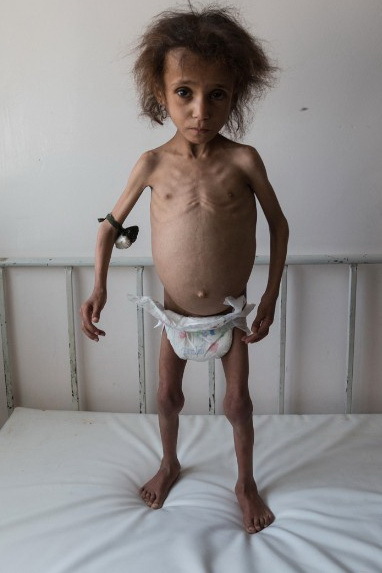 Yemen is in the grip of a vicious cholera outbreak and a near famine that have coincided to create one of the worst humanitarian crises on the planet. But you won’t find the story splashed on front pages and leading news bulletins around the globe — Yemen’s grinding two-and-a-half-year civil conflict is often called “the silent war” because it receives relatively little attention in the media. CNN has found that the Hadi government of Yemen and its Saudi Arabian-led backers are actively seeking to block journalists and human rights organizations from flying in on aid flights. Jamie McGoldrick, UN Humanitarian Coordinator in Yemen, warned CNN of the toll that the lack of media coverage is taking. He said the UN has been unable to raise even 30% of the funding it needs to deal with the crisis. Since the conflict began, the Saudi-led coalition, which has US support, has imposed a blockade on the country that has left nearly 80 percent of Yemenis reliant on humanitarian assistance for their most basic needs. Drastic reductions to the U.S. foreign aid budget would be “a bad thing” because the relatively small amount of money is well-spent, former President Bill Clinton told a coalition of U.S. humanitarian and development groups on Tuesday. “It’s a bad thing if the government cuts US AID, because it’s a little bit of money doing an outsize amount of good,” Clinton said. The Trump administration wants to cut funding to the U.S. Agency for International Development by nearly one third in the fiscal year starting in October. There is strong congressional opposition to the proposal, part of efforts to slash the diplomatic and development budget from $54.9 billion to $37.6 billion. Clinton was speaking to InterAction, which says the cuts would be “devastating” at a time when famine threatens the lives of 30 million people and conflict has displaced 65 million worldwide, an all-time high. He said responding to challenges such as climate change and poverty required interdependence rather than an “us and them” mentality, which has gained traction in response to some of the negative effects of globalization. “As an editor, I think about who is going where, and why,” shares Tiffany Harness, Middle East editor. She recalls one such experience: The young mother was crying, uncontrollably it seemed, as the rescue boat that had picked her up off the coast of Libya drifted in the sea. Her photo (click icon at left), taken last month by Chris McGrath of Getty Images, conveyed a heartbreakingly common story in a crisis marked by death and numbers. More than 5,000 migrants and refugees drowned last year in the Mediterranean as they tried to reach Europe. 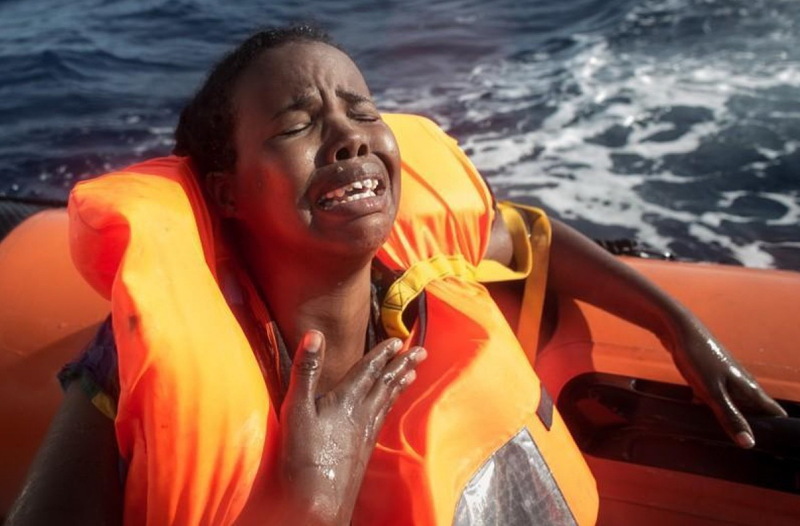 More than 1,600 have drowned in the same waters this year, according to the International Organization for Migration, a slower pace than last year but still horrifying. An elevated risk of famine persists in parts of Somalia due to severe food consumption gaps, high acute malnutrition and disease burden. Over 6.7 million people are in need of humanitarian assistance; more than 700,000 have been displaced since November 2016 and diseases such as AWD/cholera and measles continue to spread. Humanitarian partners have significantly scaled up assistance, but these efforts must be sustained to avert famine, particularly in the worst drought-affected areas that are already facing severe food insecurity, alarming rates of malnutrition and disease outbreaks. The United Kingdom has announced an additional aid package of 60 million British pounds (about $77 million) to Somalia to help tackle the current humanitarian crisis caused by the prolonged drought. The announcement was made yesterday by the United Kingdom Secretary of State for International Development, Priti Patel, who visited Somalia to assess the drought situation that has forced hundreds of thousands of residents to abandon their homes in search of food and shelter. The Secretary of State noted the latest assistance was in addition to the 100 million pounds of aid disbursed by Britain to Somalia since her last visit earlier this year.